Bonds are debt obligations of the issuer to return the principal amount with interest to the investor. Bonds are issued by both domestic and foreign entities such as a government or corporation. So it can be differentiated based on geographies, just like equities. Refer to our previous blog on equity Equity Funds (right to ownership). But the more common differentiator for bonds is time horizon or duration. The bond or debt duration varies from 1 day to 30 years. There are different ways to slice and dice bonds but let’s focus on the most common factors. 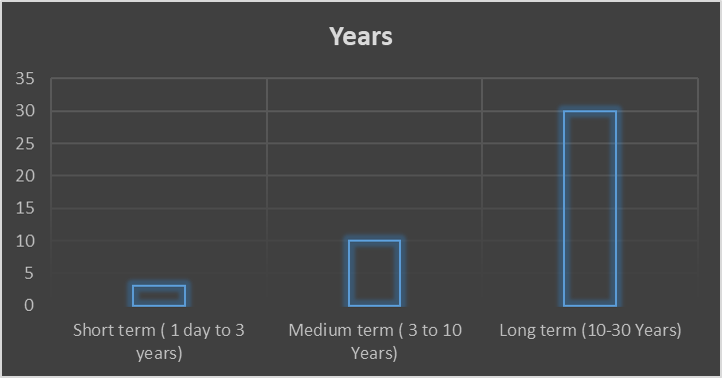 Long-term bonds are usually 10 or more years in duration, Medium-term 3-10 years and Short-term 1 day to 3 years. The choice of a term depends on the investment horizon. The longer the term, the higher the interest rate. You, as an investor will be subject to a higher risk for a longer period of time. If you are looking for very liquid investment, you should pick Money Market funds. The maturity of the securities part of money market funds is usually under 13 months and mostly consists of highly rated treasury securities of shorter duration. Bond is a huge market and it’s even bigger than even equity markets. 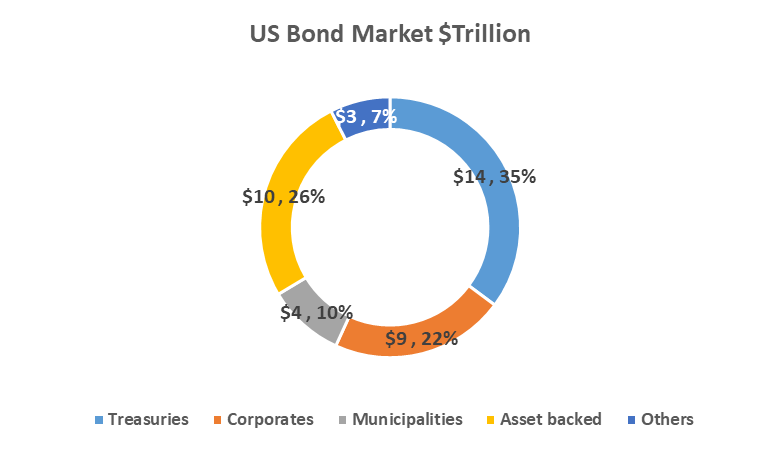 The three main issuers of bonds in the US are US Treasury, US Municipalities and Corporates/Businesses. In addition to these 3, there are bonds backed by your mortgage, cars and other kinds of assets commonly known as Asset-backed securities. The mortgage-backed securities are well known and we all have experienced, the painful recovery after the last market crash which started as a result of sub-prime mortgage-backed securities. Treasury is the biggest player in US bond market and comprises of 35% or $14 Trillion of the total bond market. It’s considered one of the safest investment option. During a market turmoil or shock, the money usually flows from equities to the Treasury securities. It’s backed by US government and is very popular both with domestic and foreign investors. US government issues various securities and it differs based on duration or tenure. The short-term usually becomes part of Money market fund which we discussed before. Municipal bonds are issued by various municipalities in the US such as state, city or town to fund various projects making roads, building a new school etc. But keep in mind, all the municipalities are not the alike. They have different default risk or credit rating and you should understand the risk before investing. Why do people want to invest in municipal bonds? The main reason is tax incentive. Usually, no federal taxes are payable on interest from municipal bonds. In certain cases, issuing state also exempt residents from paying state taxes. But if you don’t live in the issuing state you may still have to pay the state tax. Another key differentiator is underlying risk or quality. The Credit Rating agencies such as Moody’s, S&P and Fitch (rating agencies) have simplified the work for an average investor assuming these agencies did a thorough job. They assign ratings for bonds issued by US Treasury, Corporates or Municipalities and give them a “Letter Grade” that can be compared to the grades you used to get in school and college. The only difference is these ratings are more elaborate. 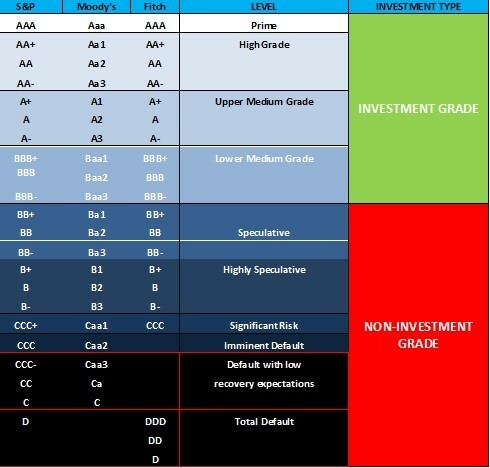 The rating agencies have created their own hierarchy such as AAA, AA+, AA, AA-, BBB- BB, C and so on (Refer the chart below). Anything equal or better than BBB- is considered Investment grade (worth investing) and lower than that are called Junk bonds or High Yield (not high in quality) which means they provide higher returns as the Risk is higher. Corporates issue bonds or debt instruments for building a new factory, buying new plant and equipment, business expansion, or for additional liquidity. As an investor what you want to know is when the time comes for repayment of debt and interest, the corporate should have enough resources to meet their obligations. One of the main concerns of an investor is how the inflation erodes the value of money over time. Here enter inflation-protected securities known as TIPS (Treasury Inflation-protected securities). The underlying purpose of these bonds is to keep the purchasing power of the money intact. Inflation reduces the value of money over time. Your grandfather could buy more goods and services for $1000 dollars 50 years ago than what you can buy today with the same $1000 dollars. If your money is lying idle in a bank account and not earning any interest, it’s actually deprecating by the rate of inflation in the economy. So the purpose of TIPS is to hedge against inflation. It’s a good idea to allocate certain retirement assets to TIPS to maintain your standard of living during retirement. TIPS are issued for 5, 10 and 30-year duration. In the list of funds offered in 401k, 403b or 457 plans, you will find bond funds offering various time horizons, issuers, geographies or quality of underlying securities. It is a good idea to include TIPS in the diversified plan if that option is available. To create a diversified portfolio some people hire a financial advisor, who may charge 0.25% to 2% of total assets, as fees. Plootus does it for Free. You may ask why? We are on a mission to democratize financial planning. Our app Plootus (available on Apple and Android) will not only choose the best performers to suit your retirement needs but will also help you to decide how much to invest in the various options available to you. Our algorithm first estimates how much money you will need for your retirement period. Sounds like a no-brainer. That’s it for today. We so far covered 2:1 principle for retirement, Bitcoin as an option for retirement, types of Equity funds & Bonds. We will dig deeper into Target dated funds next time. Feel free to use the comments section and we will be happy to answer any questions you have.